Bullseye Event Group, one of the nation’s leading Sports Travel package provider and event ticket companies, recently launched a complete website redesign, introducing new packages and enhancing the visitor experience. We designed the new BullseyeEventGroup.com to reflect our continuing growth and outstanding commitment to personalized customer service. "Many times a customer's first interaction with a company is through the company's website," says Bullseye Event Group representative Kyle Kinnett. "We designed the new BullseyeEventGroup.com to reflect our continuing growth and outstanding commitment to personalized customer service." 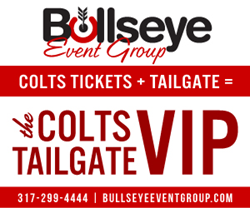 In addition, as the Official Events and Travel Partner of the Indianapolis Colts, Bullseye Event Group is the official host of The Colts VIP Tailgate as well as the premier source for Colts pre-season, season tickets and single-game seats for every home game at Lucas Oil Stadium. Colts fans can buy tickets to Colts away games through BullseyeTicketGroup.com. Indianapolis, IN-based Bullseye Event Group has been a pioneer in the ticket and travel industry for over 25 years, providing sought-after Super Bowl and Masters travel packages and growing to include exclusive pre-game parties and unforgettable experiences for fans all over the country. The professionals at Bullseye have helped the industry evolve into the $16 billion business it is today. Bullseye Event Group is regarded as the most cost effective, user-friendly and customizable ticket and travel group in the industry and ensures you the best purchasing experience, deliverability and peace of mind when planning to attend these iconic events. The company prides itself on exceptional customer service, speaking credibly to any ticket and travel option of interest.